Lofty Bath White or Peak White, Alpen-Weibling, Pieride du velar ou Veine de vert ou Marbre des alpages. This relict species is distributed in the Palearctic zoogeographic region, and is represented in Armenia by subspecies P. c. chrysidice (Herrich-Schäffer, ), which is the inhabitant of high mountain grasslands of Central regions of the country, at elevation range from 2500 to 3300 m a.s.l. The host-plant of the species is Dentaria microphylla, a very specific herb, which prefers screes formed by smaller stones. The Peak White gives one generation per annum, having butterflies on wing from early June till mid August. The species was first found in Armenia in 1980-s as an occasional specimen, and later, in 2007, its distribution and abundance were somewhat clarified. 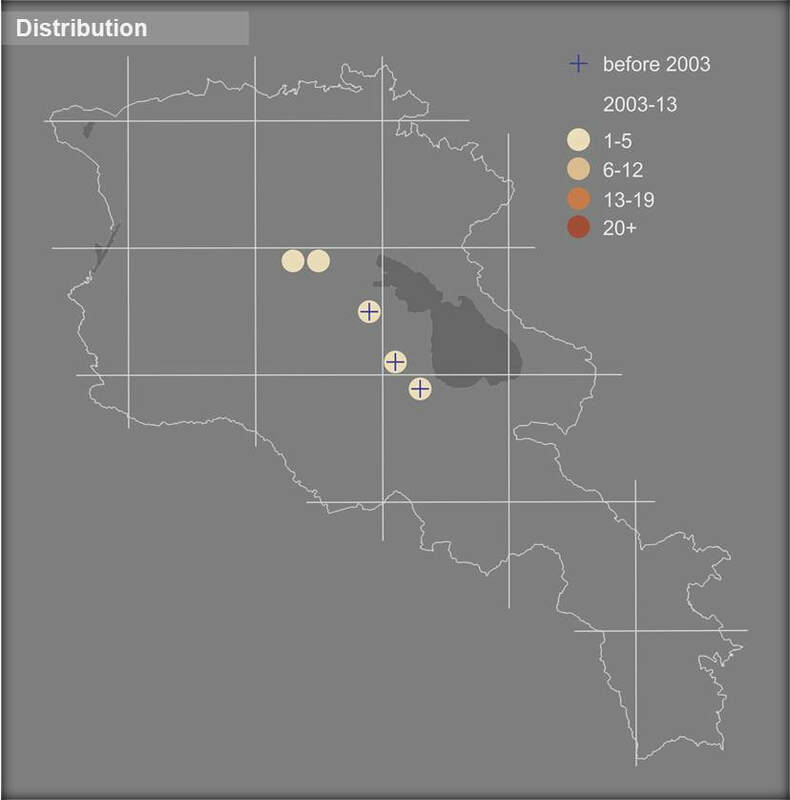 It is quite rare within the typical habitat, and at current the population trend cannot be computed for two reasons: at first its distribution is out of the BMS transects, and at second the time span between 2007-2013 is insufficient. Presumably the species doesn’t face such common threats as overgrazing and mowing, due to very specific habitat, which is not used by shepherds. However such a narrow range can be affected by climate change, and that is the threat, which has not yet been studied for the Peak White. For the reasons mentioned above, the suggested conservation status of the species is Data Deficient, despite the fact that it was evaluated for the European Red Book as Least Concern, has not been assessed for IUCN and National Red Lists, and is not included in Bern and CITES Conventions.